Are you interested in bringing your imagination to life? With 3D printing and design, you can take a concept or idea from your brain to the computer and print it in a variety of materials. Or with a 3D pen, you can even "draw" directly from pen to 3D. Whether you've attended an ideaX 3D drawing class or not, we've got resources to explore this technology at home and in the community. Up and Running With 3D Printing: This video course from Lynda.com will introduce you to the basics of 3D printing. You will need to log in with your library card number and password to access from home. There are several other related courses you can do for follow up. TinkerCAD: TinkerCAD is a free browser-based 3D design and modeling tool that you can use to create your designs for printing on a 3D printer. Shapeways: Once you've created a design, you can upload your files to Shapeways and print in a variety of materials for a fee. Thingiverse: MakerBot's Thingiverse is a thriving design community for discovering, making, and sharing 3D printable things. Find a design to print or share one of your own. 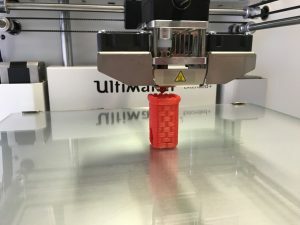 There are several makerspaces around King County and beyond that allow you to join and use their resources, including 3D printers and other tools. Fees and required training vary, so contact locations directly. If 3D printing interests you, consider applying the skills in formal education or even a career. If you're in middle school or high school, look for elective classes like Applied Engineering, Design and Production, Media Technology, Computer Graphics, Engineering Design, Computer Aided Design (CAD), or Studio Art with 3D/Sculpture Focus. In college, major in a subject like computer graphics/graphic design, engineering, industrial design, or art/sculpture. Career fields include 3D design, industrial design, animation, computer-aided design (CAD), product design, or art.